Click Here To Order I Sold the Moon ! 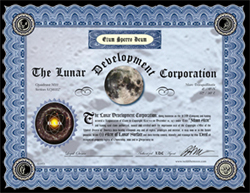 and/or your official Lunar Moon Certificate! The world's greatest conversational piece! is a true story. 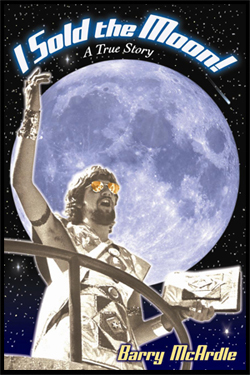 It's a rollicking ride through the 1970's with the original Moon Man - a silver-suited street performer and comic philosopher. For ten years, Moon Man crisscrossed America selling "lunar real estate." is for anyone who believes in folowing their dreams. It's cosmic, perceptive, passionate and fun. Mostly fun. is also a love story. Here is the bliss and the heartache of a grand "first love," struggling to survive the tumultuous, hedonistic era of "free love." It has been said that there are more Galaxies in the Universe, each with over a billion stars - than there are grains of the sand on all the beaches, of planet Earth, - combined. Next time you're on the beach pick up a handful of sand and just for a moment refelct that each grain represents an entire Galaxy - that's thinking Cosmically. And if it is equally true that we, along with all matter in the universe, are as Carl Sagan says "Star Stuff" then it is truer still that this Earth and all who live on it are interconnected. So when you do anything, no matter how insignificant it may seem, to help the environment you are helping yourself and you are acting Globally. See I Sold The Moon "Movie Pitch"